The story goes that St Bride was unable to give Mary and Joseph shelter but gave them bannocks before they continued their journey to Bethlehem. Once they had left Bride they found the bannocks had miraculously replenished themselves. Very few customs of the Festival of Bride survive but it was once customary for mothers to give bannocks, butter or cheese to the girls who visited with the brideog, the Bride’s doll. The girls would then congregate and pool their bannocks before the boys turned up for a party. Things don’t change do they? Although bannocks come in several shapes and forms, from a flapjack type cake to a scone like mixture. I have chosen Sauty Bannocks that are also traditional made for Shrove Tuesday. These pancakes are oat based and therefore a good alternative for any of you with gluten intolerance. Important Note.... the batter needs to be made the day before. Place the porridge oats in a food processor and blitz until it has the consistency of a very rough flour (you can use oatmeal flour but I the blitzed oats gives a slightly crunchy finish to the pancake). 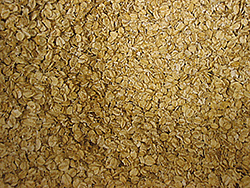 Tip the blitzed oats into a large mixing jug and stir in the other dry ingredients. Add the egg then gradually beat in the milk. When ready to use, give the batter another beating. Lightly oil your pancake pan and cook as you would ordinary pancakes. These are more substantial than the usual pancake and will take longer to brown and holds together enough to flip. The finished pancake can be served buttered or with sugar and lemon juice, or your preferred pancake topping. These went down very well with my “Official Taster” who has said they are his pancake of choice this Shrove Tuesday.